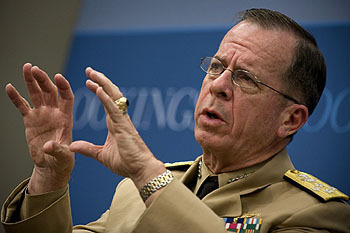 Perhaps Mullen’s most provocative “principle,” as he called it in the speech, is that military forces “should not — maybe cannot — be the last resort of the state.” On the surface, Mullen appeared to offer a profligate view of sending troops to battle, contradicting the Powell Doctrine’s warning that the military should only be used when all other options exhaust themselves. Powell’s warning has great appeal to a country exhausted by two costly, protracted wars, one of which was launched long before diplomatic options had run out. But Mullen’s aides said the chairman was trying to make a subtler point, one that envisioned the deployment of military forces not as a sharp change in strategy from diplomacy but along a continuum of strategy alongside it. “The American people are used to thinking of war and peace as two very distinct activities,” said Air Force Col. Jim Baker, one of Mullen’s advisers for military strategy. “That is not always the case.” In the speech, Mullen focused his definition of military force on the forward deployment of troops or hardware to bolster diplomatic efforts or aid in humanitarian ones, rather than the invasions that the last decade saw. Italics mine. To be honest, I’m not sure the American people do think of war and peace as two very distinct activities. America has sent troops into significant combat actions eight times over the past three decades — more depending on what you count as “significant” — which means that the American public is pretty damn used to the idea of troops being sent overseas at virtually the drop of a hat. Sending troops into trouble spots is very much the norm for Americans, not an unusual occurrence. Mullen seems to be acknowledging this more than he is trying to change public perceptions about it. Mullen’s major proposal is that the military should be deployed for future counterinsurgencies or other unconventional conflicts “only if and when the other instruments of national power are ready to engage as well,” such as governance advisers, development experts, and other civilians. “We ought to make it a precondition of committing our troops,” Mullen said, warning that “we aren’t moving fast enough” to strengthen the institutional capacity of the State Department and USAID in order to lift the greatest burdens of national security off the shoulders of the military. Is this something that mitigates Mullen’s seeming willingness to use military force more frequently? I’m not so sure. Partly it’s just the same sniping between the Pentagon and the State Department that’s been around forever but has become especially acute over the past decade. But it’s also partly a positive recommendation that we beef up our civilian capacity so that we can intervene overseas more effectively. Mullen is apparently afraid that lack of civilian capacity will hamstring our ability to use military force in short, intense bursts, something that he thinks we should be better at. This ought to be more controversial than it is. The Afghanistan and Iraq wars have made it clear that the occcupation phase of wars is as important as the main combat phase, so it makes sense to focus on improving that. At the same time, those wars (as well as Kosovo) have also made it clear just how difficult and resource intensive long-term occupations are. Getting “better” at it will be immensely costly. So: just how good do we want to be at this stuff? Good enough that we can continue to intervene frequently in overseas conflicts? Or just good enough that we can do a decent job on the rare occasions when we really need to intervene overseas? I’d vote for the latter, but in any case, it’s not a decision that should be made without lots of public buy-in in the first place.